Growing up I was always told to never get into intense discussions about politics or religion because people’s points of view on both are rooted in their values and beliefs and when those points of view differ from one another, both parties can tend to become very offended. Well, even as a former preacher and minister, I still follow that rule. In other words, what you are about to discover here is not me pushing anything upon you or “shoving it down your throat," for lack of a better term. And rest assured, you have arrived at the right place. 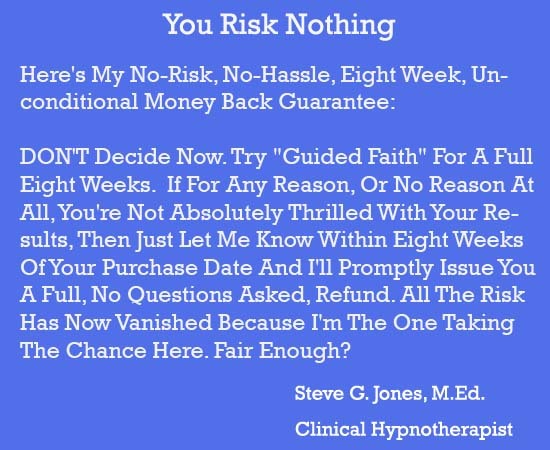 My name is Steve G. Jones, Clinical Hypnotherapist, and for more than 25 years I have been helping people create positive, lasting change in their lives using the power of hypnotic influence. Ever since I was a young boy, I always had a burning desire to learn about how the mind works and how people could program their minds to achieve success or just simply enrich their lives. Being the curious thinker that I am, I always want to know how things work. And so naturally, I always want to learn more about infinite intelligence or God as we know it. My desire - along with my natural ability to speak well in front of crowds - ultimately led me to the church where I was a preacher and minister for 5 years. And now after years of research on how I could create a system to influence others to develop faith in God, I have fulfilled my mission. The Universal Religion - Here I’ll address the idea of different religions and Gods and how this program will help you increase your faith in God, regardless of your religious preference. My First Hand Learning - Here I’ll share my personal experiences as a pastor and more importantly how they have contributed to my ability to help you. Religious Exposure - Here we’ll cover my exposure to a variety of religions and why your Faith In God doesn’t have to revolve around one religion. Faith vs. Belief - Discover the difference between faith and belief and realize the profound impact it will have on your life. Bible 101 - Here I’ll cover different verses from the bible and how they will help you relate to God. Faith Through Action - Here I’ll show you how to develop faith through action rather than just reading. Building Faith - Discover the secret to building faith and keeping it alive. Knowing God - Here you’ll learn the truth about what it takes to really know God. The Secret To Keeping Your Faith - Here I’ll show you the one key to keeping your faith alive. The Meaning Of The Old Testament- Here we’ll cover the old testament and the role it has in developing your faith. The New Testament Uncovered - Here we will use the new testament to learn the teachings of Jesus. Faith Evaluation - Here we’ll cover the aspect of evaluating that which you have invested your faith in to see the effect it has had on your life. Experiencing The Ultimate - Discover the experience of knowing Christ and all he is capable of. Learning Your Value - Here you will learn about your value in life and how it affects all that you do. Moving Forward With Sin Mistakes - Discover how to view mistakes as a part of life that you can learn from, as opposed to roadblocks that will forever stop you. Building Your Relationship With God - Learn the key to always having God listen to you and why what you’re doing now may not be working. The Key To Keeping Communication Alive -Here you’ll discover the power of prayer and how it will enable you to have ongoing communication with God. Prayers For Faith - Here I’ll share my personal prayers that will help you get where you want to be in terms of your new found faith. The Hidden Treasure - Discover the secret to building faith that most people never find. Finding Inspiration - Here I’ll cover everything you need to find inspiration when you feel that your back is against the wall. Connection To Your Faith - Here I’ll show you how you can let the power of prayer empower your faith in God. Building Strength Through Faith - Learn my personal techniques on how you can build strength in your faith in God. If you are ready to take the first step toward building your faith in God, then I invite you to take advantage of this unique opportunity to own a resource that will provide you with all the tools you need to do so. 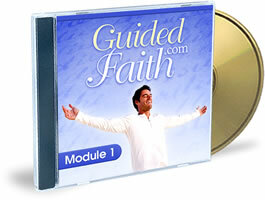 For just $27.97, you can own one of the most effective programs on the planet for developing your Faith In God. But wait, I’m going to make the decision even easier by allowing you to try the "Guided Faith" program absolutely risk free. Here’s how it works. So let me ask you, are you ready to experience a connection to God once and for all? Are you ready to see everything that exists beyond everything you have seen and felt thus far? If so, then don’t wait any longer. Take the first step now by getting the Guided Help that you need! P.S - Remember, you have nothing to lose and everything to gain because you have the next 8 weeks to see how truly effective this program is, risk free.